Ta-da! Behold the latest in footwear fashions. (No, the photo is not sideways.) The unique design enhances ankle warmth and circulation while leaving your toes to cool off and wiggle about as they desire. The spikes protect from any little nippy dogs, and the ball of yarn drags along in case you have a sudden knitting urge. Yes, I’m planning to finish it. And its mate. This one will have some queer little lumps and bumps in it. Things like “repeat rows A and B until x amount remains on the needles” should not be listed after “continue.” What do they think I am? A knitting guru? Ahem. Well, anyway, it seems to be turning out despite the difficulties. I can get it on. And off. The week of fleece washing didn’t accomplish as much as I was hoping, but I did get a pretty sizeable pile of fleece washed. And while there is still a whole garbage bag full of dirty fleece, I think this will keep me busy for a while. I actually got a pretty fair amount of this carded, but the carded got used in another project before I took any pictures of it and is now hanging out to dry. I did decide to break out of my usual “rolag” carding method and turn the carded fluff into these nice little balls of homemade roving. Not quite as smooth and buttery as store bought, but it’s fun to use and spins nicely. The pink and purple are from cochineal dyed fleece. Yes, I still have that fleece laying around. Two nice chunks of it. 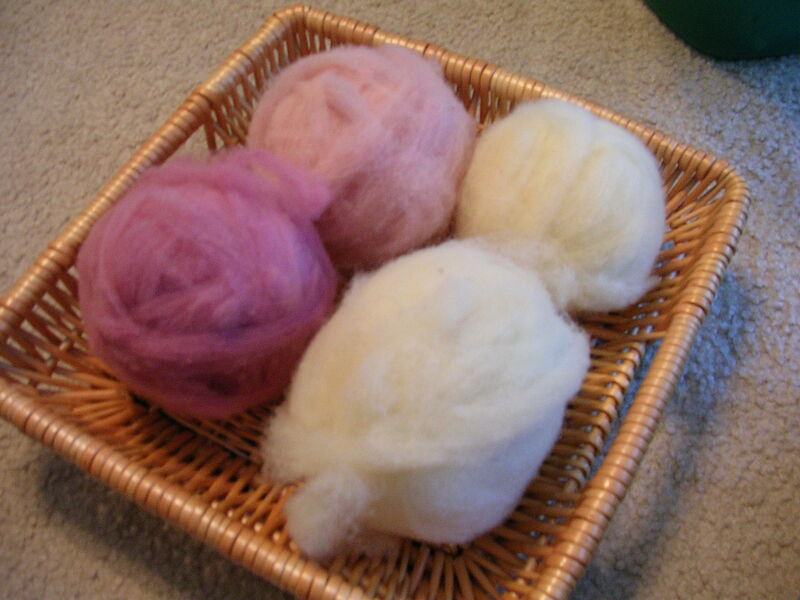 To my mind, a drop spindle is the cheapest, easiest, and most versatile way of getting into spinning. There is something so cool about being able to make yarn with a piece of carved wood that hovers in midair. But, although I love them to pieces, drop spindles aren’t for everyone. They require the ability to raise your arms until your hands are on a level with your head and hold them out there for longish lengths of time. Sound too strenuous? I’ll cover wheel types in the next post. This is the drop spindle version of spinning tutorials. The wheel version will be coming soon. Alright, you’ve got your spindle, some sort of wool, and a whole lot of excitement. Now you need a piece of pre-made yarn (commercial will do) about two to two-and-a-half feet long. Plain yarn is best. Don’t go for the fancy boucle or eyelash. Just some scrap yarn you have laying around. Alright, got it in your hand? This is your “leader” yarn. It is what makes it possible to easily begin the act of spinning. It’s what you’ll be attaching your fiber to and dangling your spindle from. In short, it’s your friend. If you happen to be feeling ultra crafty and coordinated today, (or if you simply can’t wait long enough to go find yarn) the first tutorial below shows how to begin without a leader yarn. So You Want To Spin? So you want to learn to spin? Good for you. You’re about to be initiated into the wonderful craft of spinning. Or, to turn it into its most basic process, the art of taking a handful of something and making into gorgeous yarns. If you’re interested in spinning, chances are you’ve at least seen a spinning wheel before. Maybe you watched someone at a Living History demonstration, or perhaps you have a friend who keeps babbling on about their wonderful wheel, or maybe (like me) you picked up a magazine and got sucked into a world of color and texture. However you developed the interest you want to get started. So now is the time for me to stop telling you how much fun you’ll have and give you some hard facts. Spinning is putting twist into something to make it form a new, stronger shape. You can spin with three blades of grass and your fingers. You can spin with long strips of fabric and a heavy rock. You can spin with your hair and a messed up curler. But none of these are the cool ways to do it. If you want to begin spinning, you’re going to need three things. Something to spin into yarn, something with which to spin that thing into yarn, and something to tell you how to do it. Alright. Let’s start with the good stuff. These hankies are made up of lots of stretched cocoons stacked on top of each other. I read on a website that it takes about thirty to forty cocoons to make an ounce of silk, so this would be somewhere in the neighborhood of fifty cocoons. I’m really curious to see if it’s cheaper to raise the silkworms yourself (assuming you have a ready supply of mulberry leaves) or just buy the preprocessed hankies. No, this is not a horror story involving Angora rabbits and sticky candy. This is the next-to-final project on my New Year’s Dash list. This is the Bunny Yarn. Ta-da! It’s done. All the work and excitement has transformed into twenty-three ounces of light-worsted/worsted yarn. According to my calculations, that means that only nine ounces of weight washed out with the lanolin. As far as I know, that’s a decent amount. I’ve read that Merino wool loses half of its weight when you wash the grease out. Anyway, I am now trying to decide what color to dye the yarn, and whether to just wing it on the pattern, or look around and see what I can find.